CEOgolfshop offers the entire Tommy Bahama product line with your custom logo. Every sweatshirt, every silk camp shirt, virtually every product made by Tommy Bahama can be customized for your company. Tommy Bahama products make a great sales incentive, event attire, casual business uniform and exceptional gift. Above: Tommy Bahama men’s Catalina camp shirt, MSRP $98. Wow! You’ll love this soft shirt and so will anyone who gives you a hug. It’s free of all decoration except the custom embroidered logo you add to it. (Quality? Tommy Bahama offers this in the Wedding Collection shirts for the groom. ) This 100% silk shirt in solid colors is versatile enough for resort, wedding, and corporate apparel has a washed look giving it the appearance of linen, but without the wrinkles. The custom logo Tommy Bahama men’s Catalina camp shirts are available in our online store with minimum 12 units, mix and match colors. Most shirts are available in big and tall, with sizes up to 5X. Contact us any quantity and any style requests; this is not the only option. Known for their idyllic island quality, Tommy Bahama exemplifies a relaxed lifestyle. We can create an entire shopping experience for your special corporate event. 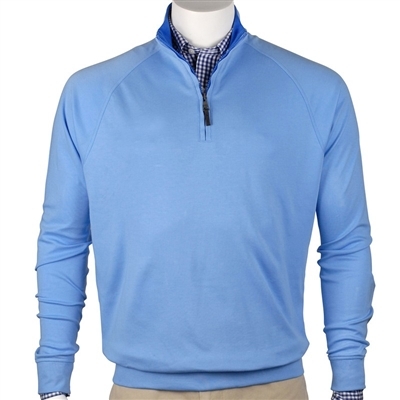 Year after year, the Fairway & Greene interlock pullover is a top selling executive custom promotional apparel gift for adding an embroidered logo. The fall 2013 season brings an update to this classic, from a solid color to solid with contrast collar and I’ve already seen this or similar outerwear on NFL game day sportscasters. The soft and luxurious interlock is made from Pima Cotton in a sporty quarter zip design. Features raglan sleeves for ease of movement, comfortable rib knit at the cuffs and waistband, and a handsome leather pull on the zipper. An attractive layering piece to complete your ensemble. Great for your golf team, executive gifts, and tournament goodie bag items. Past Season Colors: Blue • Red • Navy • Light Charcoal • Black. Black and Red are in stock as of 10/14/2013. Luxurious interlock from 100% Pima Cotton. Simply the finest garment of its kind. About Fairway & Greene: Fairway & Greene makes exceptional quality apparel, found in the finest golf shops, department stores, and corporate America. About CEOgolfshop: CEOgolfshop specializes in volume orders for active lifestyle apparel and executive gifts. While most companies carry only a few colors, we offer the entire line of each brand, so when a customer falls in love with a brand, they have the most choices. Celebrities everywhere on TV were sporting orchid gingham shirts this past weekend. On NFL pregame show I spotted four sportscasters wearing similar shirts, and then a 60 minutes correspondent was wearing one too. Here are some of their pictures. Here’s a link to buy men’s gingham shirts and a link to men’s orchid shirts.